Kelvin Cheung is the COO of The Good Lab, a social innovation consultancy and co-working space that partners with leaders and influencers to drive social change through workshops, grants, networking opportunities, and community engagement programs. 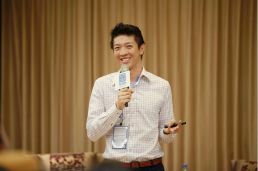 As a speaker at the “Dialogue with Social Entrepreneurs” session at the BXAI Summer Program 2017, Kelvin shared with scholars about how The Good Lab aims to find solutions to social issues by bringing people from different political spheres, backgrounds, and socioeconomic classes into the same room and mediating reconciliatory discussions. He is also CEO of UnLtd Hong Kong, an organization that funds and supports early-stage innovators seeking to tackle economic and social inequality in the community. For Kelvin, a defining moment in his life came early on when he discovered that he had not been accepted into any of the teachers colleges that he applied to. Having dreamed of becoming a history teacher since he was a teenager, Kelvin realized that this apparent “setback” actually opened up new possibilities to explore an alternate course. After spending some time in Beijing studying Chinese, Kelvin decided to pursue a master’s degree in international development, which cultivated his passion for social entrepreneurship and ultimately opened up a new career path for him and led him to where he is today.